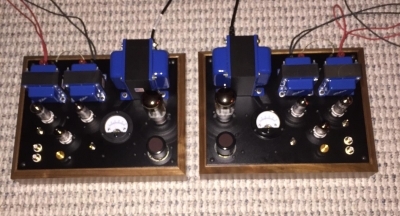 A mirrored pair of SET amplifiers, presently being used in bridged mode. All P2P construction using silver solder. I included a "Hazen grid" capacitor and input tube bias change switch. The single mA meter displays individual output tube bias current with a Left/Right switch. Edcor XPRW178 power transformer and GXSE10-6-8K output transformers. Upgraded caps to Jantzen Audio 1200V Z-Superior. Upgraded resistors to PRP PR9372 Audio for metal film and TAKMAN REX for carbon film. ALPS Blue 100K attenuator. The power supply uses a RCA 5U4GB rectifier and Hammond 156R choke. Matched pairs of Svetlana SV83 for power and JJ E88CC for the input tube.